Compressed Air Treatment Equipment Market size was valued over USD 7.0 billion in 2016 and the industry will grow at a CAGR of more than 6.0% up to 2024. Rising use of compressed air in various end-user industries will propel the compressed air treatment equipment market demand in the forecast timeframe. Rising focus towards increasing the production efficiency in order to actively compete in the industry will augment the product demand. End-user industries such as healthcare, food & beverages, general manufacturing, etc. require clean and dry compressed air for their regular operations. Presence of any impurities may lead to damage of valuable equipment or clogging of the delivery systems, resulting in productivity, operational, as well as capital losses. Quality of the air supplied is of utmost importance for some of the end-user industries such as medical & pharmaceutical, food & beverage, etc. Superior quality of air with least possible level of contamination is one of the topmost priority of these industries. This filtered and purified air finds extensive application in critical operations in the medical and pharmaceutical fields. The slightest contamination present in compressed air supplied to the food & beverage industry could lead to possible health hazards and unsuitability of food for consumption purpose. These factors will drive the compressed air treatment equipment market in the near future. Compressed air treatment equipment market has one of the least energy-efficient applications with a typical system delivering only 10% efficiency. These factors lead to very high operational costs of the machinery which in turn increases the maintenance costs as well. High maintenance and operational costs of the systems may act as hindrance for the compressed air treatment equipment market. Based on product, the market is segmented into four major categories as filters, dryer, aftercoolers, and others. The others segment consists of condensate treatment equipment, purifiers, drain traps, etc. The filters segment is further classified as particulate filter/ pre-filter, coalescing filter/ oil removal, adsorber filter/ oil vapor removal, filtered centrifugal separator, high temperature after filters, and moisture separators. The overall filters segment held a major share in the compressed air treatment equipment market and will grow with a highest CAGR of over 6%. Aftercoolers are popularly known to provide an effective, economical and easy way to remove moisture from compressed air and are typically located before dryers. The segment held a market share over USD 1 billion and will grow at a significant rate in the coming years. 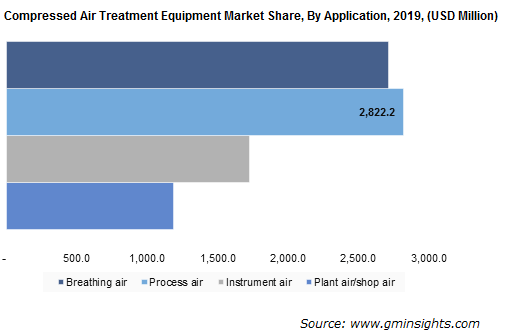 Considering applications, compressed air treatment equipment market is segmented into plant air/ shop air, instrument air, process air, and breathing air. Increasing emphasis on product quality and rapidly developing industrialization are the prime factors for the market growth for plant air or shop air. The segment was valued around USD 1 billion in 2016 and will grow at a moderate rate. Process air finds maximum usage in the operational processes such as chemical reactions, logistics, wind tunnels, baghouse discharge systems, etc. Stringent regulations and government mandates regarding the safety standards in the industrial processes will further boost the compressed air treatment equipment demand for process air. The segment will grow at a steady rate of around 5% and hold a maximum share by the end of the forecast period. Compressed air treatment equipment market is segmented on the bases of end-user industries as chemical, paper, food & beverage, healthcare, automotive, steel, construction, aerospace, electronics and others. The others segment consists of end-user industries such as leather, textile, mining, etc. Chemical is one of the important segments with a significant market share in 2016 and was valued close to USD 500 million in 2016. Food & beverage and healthcare are the segments which use compressed air for critical purposes. Safety standards and regulations set by the governing bodies will drive the compressed air treatment equipment market for superior quality air supply. This segment will be the fastest growing, registering a CAGR over 6.5%, driven by the rising demand of processed and packaged food. Asia Pacific led the compressed air treatment equipment market and will further grow with leaps and bounds owing to extensive industrial activities carried out in this region. The segment was valued over USD 2.5 billion in 2016 and will grow with the highest CAGR in coming years. Following Asia Pacific is the European region holding close to 30% of the overall share. With a mature compressed air treatment equipment market in the U.S., North American region is primarily driven by the healthcare and food & beverage industry. U.S. has a highly developed and automated food & beverage industry with several refrigerated warehouses which will augment the product demand due to the requirement of purified compressed air in the facilities. The competitive landscape is highly fragmented with the prevalence of numerous manufacturers throughout the globe. Top players with a high share in global compressed air treatment equipment market include Gardner Denver, Atlas Copco, Donaldson Company, Atlas Copco, Mann+Hummel, Emerson Climate Technologies, Ingersoll-Rand, Parker Hannifin, and Kaeser Kompressoren. Other significant players in the market include Aircel Corporation, Aerzener Maschinenfabrik, Elgi Compressors, Quincy Compressor, Sullair, Sullivan-Palatek, Van Air, and Wilkerson Corporation. Atlas Copco is one of the giant industry player with more than a tenth of the overall competitive market share. The company recently acquired Glauber Equipment Corporation’s compressor-related business. Recently, the company also acquired Mobilaris MCE AB Sweden-based company, and Pressure Compressores, a Brazilian manufacturer of piston compressors and related equipment. The industry is highly versatile in nature and varies from region to region based on these end-user industries. The different equipment with varied functionality are suited for majority of industrial applications as they supply clean and dry compressed air for the pneumatic tools and machineries. Growing focus towards automation and precision engineering will make the products indispensable as the presence of slight amount contaminants may lead to huge losses to the industries.